Participants pictured are, seated l. to r., Pete Cucuz, instructor; Jim Paglia, Local 28 (Newark, New Jersey); Manny Ypsilantes, instructor; Jay Brophy, MOST; Tim Clark, GEM; Todd Blankenship, Local 456 (Rock Hill, South Carolina); Herman Gibbs, Local 26 (Savannah, Georgia); and Bridget Connors, MOST. 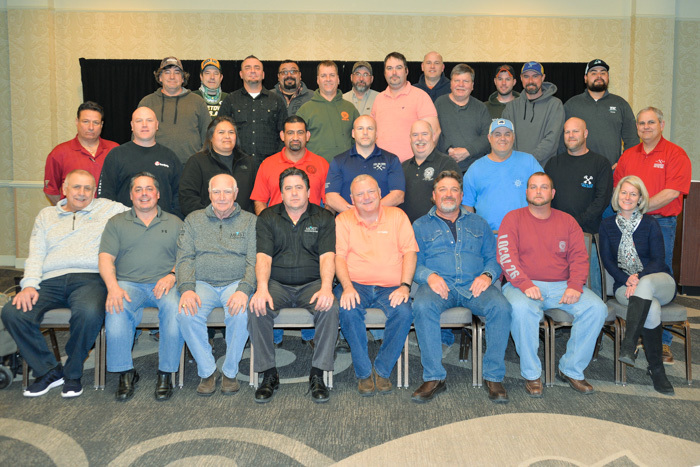 Middle row l. to r., Tony Smarra, MOST; Matt Fink, Local 13 (Philadelphia); Richard Lerma, Local 627 (Phoenix); Darren Lindee, Local 60 (Peoria, Illinois); Tom Green, Local 13; Shannon Bates, Local 454 (Chattanooga, Tennessee); Chris Knox, Local 83 (Kansas City, Missouri); and Mark Garrett, D-H&SS. Back row l. to r., Bill Jenerou, Boldt; Scott Kuchta, Enerfab; Darrell Manroe, Local 83; Ramiro Gamboa, Kiewit; Gerald Calvert, Local 83; Arron Richardson, Local 5 Zone 197 (Albany, New York); Sean Coleman, Local 13; James Irwin, Local 363 (East St. Louis, Illinois); Ron Dickens, GEM; Mark Kuergeleis, Local 363; Marty Smith, Local 363; and Josue Zammaron, Kiewit.